The first Church of St Stephen in Willunga was opened on this site on 17th April 1849. Rev A B Burnett had arrived in Willunga in 1847, living in a tent until he found accommodation in the home of one of the settlers. He held Sunday services in one of the local hotels. Within two years, Government grants, Bishop’s funds and subscriptions from residents enabled Rev Burnett to proceed with the building of the Church. It stood on 2 acres of land donated by Richard Hill. 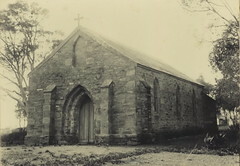 In the 1860s it became evident that the building needed repairs and was also too small for the growing congregation, as well as not being central to the town. However, with the opening in 1865 of St Ann’s Church at Aldinga, the rebuilding in Willunga township was postponed until the 1880s. The first Church of St Stephen served the community until 1884 when the present Church of St Stephen was opened in St Andrews Terrace. The old building stood within St Stephen’s cemetery and was used as a mortuary chapel until it was demolished in the 1920s. Some of the stone was used to build the porch of the Oddfellows Hall in High Street. St Stephen's Anglican Cemetery remains in use on the site. 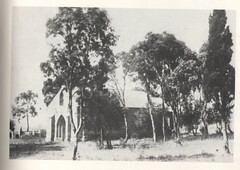 St Stephens Church (first), Willunga, 1901. Do you remember St Stephen's cemetery and first church site ? Then Join up and add your memory here.